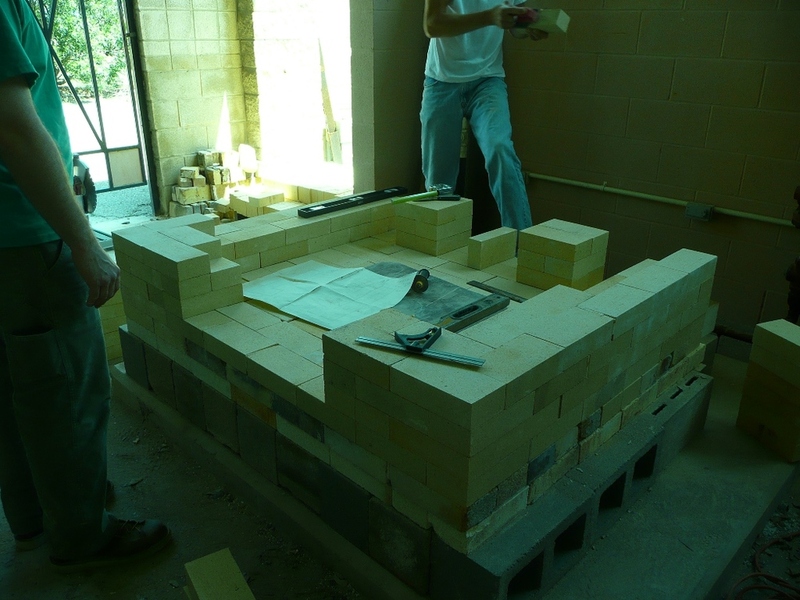 After the bricks melted out on the last soda kiln, we needed to rebuild, starting from scratch. Here are some images from the build. Click on a picture to see a larger image and a caption. You can also scroll down to see a video of us dropping the arch form. Bottom layer is cinder block, then softbrick, then junky Butler bricks, and lastly hard brick. After starting the first course, I decided to expand the footprint by a brick- which meant unstacking brick and restacking brick--which happened a lot. I wanted the ports to be too big rather than too small. The arch curve that we settled on is 1211212112112121121. The arch was calculated for 9" brick. Unfortunately, the brick was about 8 7/8". So we tried to fill the gaps with hard brick shims. Don't do this. It doesn't work. So after we dropped the arch form, the shims all fell out. So we unstacked the brick, labeling each by number. After the third go around (!) we decided to pack the gaps with Missou castable. Time to weld in the angle iron frame. Time to drop the arch form. Hoping the arch bricks stay in place. Looks pretty good. We won't really know how well the Missou castable works until we fire it a few times.